In the future dependence on wireless communication will increase. To make sure everything that depends on wireless communication is reliable, wireless communication should be reliable. We propose that independent measurements should be able to verify the reliability of wireless communication. 5G is the abbreviation for the fifth generation wireless communication system. However, most research on future wireless communication is currently labeled 5G, even if it is not strictly part of 5G. The 3GPP has recently completed its release 15, which is the first 5G standard. Release 15 focuses on only one of the three dimensions of 5G: enhanced Mobile Broadband (eMBB) provides high data rates, for example for video streaming, which are developed mainly for end users. 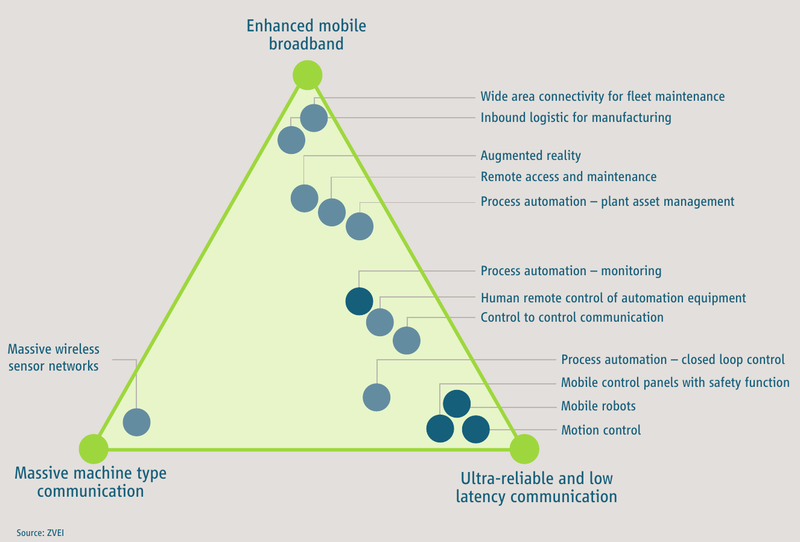 The other two areas are massive machine-type communication (mMTC) and ultra-reliable and low-latency communication (URLLC). The researchers working on mMTC try to provide energy-efficient wireless access for millions of devices, which each have relatively low performance requirements. In contrast, the goal of URLLC is to support devices with high requirements that are not based purely on data rate, such as low latency and high reliability. URLLC is not primarily developed for end users, but for professional applications. We consider URLLC to be the most interesting aspect of 5G, because it will open up new areas of application for wireless communication. The goal of URLLC is challenging: reliably transmit data with low latency. Individually these goals have already been solved in the past: (1) Engineers made communication more reliable by, for example, repeating lost transmissions. However, retransmissions increase the time to finish a transmission. (2) Low latency has been achieved by skipping features that consume time such as channel state estimation and retransmission. This in turn leads to less reliable communication. To achieve reliable and low-latency communication at the same time is a complex problem. However, because of its large impact, many researchers have worked to solve it, and the 3GPP plans to include URLLC in release 16, which is planned to be completed in December 2019. URLLC is important for at least two areas of application: industry and automotive. Historically, machines that needed reliable communication with low latency, have been connected by wires. 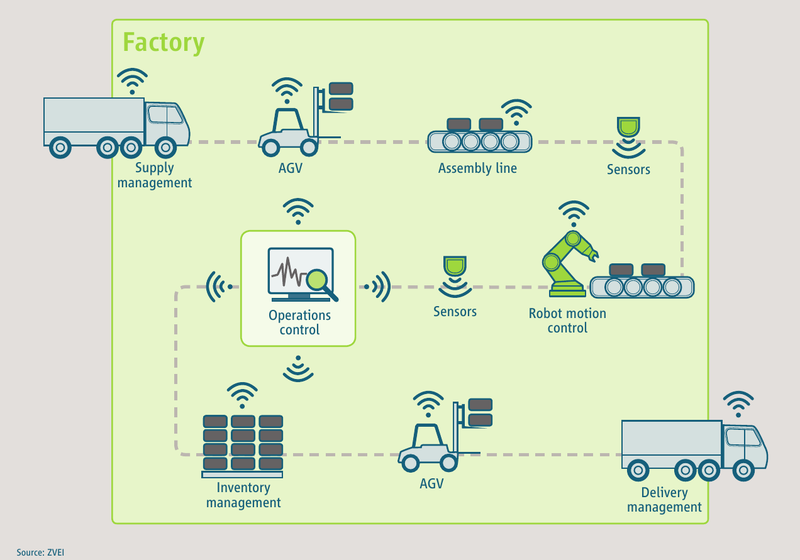 However, to reduce costs and make factories more flexible, wireless communication is becoming more popular in industrial applications. As the development of a standard and the accompanying hardware is expensive, a reasonable approach is to reuse 5G technology in factories. To make sure the demands of industrial applications are considered during the development of 5G, the 5G Alliance for Connected Industries and Automation (5G-ACIA) provides a forum of exchange for industry and telecommunication engineers. While the trend in industrial applications is to move from wired to wireless communication, the trend in automotive is different. Car-to-car communication has always been wireless, but not digital: Turn signals, brake lights and traffic lights use visible light to convey information. While this type of communication will stay in use for now, it can be extended by digital wireless communication to convey more information. Cars can, for example, not only show their position by light, but also transmit their speed and planned trajectory using digital wireless communication. Additionally, traffic lights can transmit the time until they change. By using more information about their surroundings, such as these two examples, future cars will be able to drive more efficiently and increase passenger comfort. In extreme cases this information can also be used to reduce the number and severity of accidents. The 5G Automotive Association (5GAA) is an organization of companies interested in using 5G for automotive communication. In industrial applications, failing communication can result in machines stopping and, thus, high costs. In automotive applications failed communication can lead to accidents, which successful communication would have prevented. Therefore, we consider it important to make sure the communication is reliable in both cases. For reliable communication two parts are needed: (1) The technology has to support the desired reliability in principle and (2) the technology has to provide the desired reliability in the environment where it is actually used. The general support for high reliability will be ensured during the development by the 3GPP. To measure whether the reliability is indeed provided at the location is complex, because of the high dependence on the environment: for example, reflections of radio waves from nearby objects and interference from other transmitters influence the radio channel. Providers of wireless networks already measure the performance of their networks, but the complexity of these measurements will increase as reliability is harder to measure than, for example, data rate. Additionally, because the loss of the ability to communicate in industrial and automotive are high, we consider it necessary to measure the reliability independently of the network providers. Another recent example illustrates how a lack of independent real-world measurements can lead to problems. During the emissions scandal (mainly know as the Volkswagen emissions scandal) the public became aware that the nitrogen-oxide emissions of vehicles are far greater during real-world driving than during laboratory tests. Since then the interest in real driving emissions testing has increased. To make sure wireless networks provide the promised reliability, we think real-world tests independent of the manufacturer and the operator of the network should be used. Ideally they should be able to detect both intentionally and unintentionally introduced problems. In our project 5G measurement lab we develop such methods to measure the reliability of wireless networks. In conclusion, future applications of wireless communication in industrial and automotive scenarios will rely on networks being available. To make sure these networks are as reliable as promised independent third parties should have the tools to measure the reliability of wireless networks. Disclosure: We were invited to a 5G-ACIA meeting for potential future members.